The food and wine (but mostly wine) tasting event of the year happens this Tuesday at the Hyatt Regency Hotel in downtown Vancouver and there are a few tickets left if you want to be part of it. Liberty Wine Merchant launched the annual gastronomical celebration Taste BC in 2008 and in the 2 years since its inception has already raised over $159,000 to benefit BC Children’s Hospital’s Oak Tree Clinic. That’s right. You can sample some of BC’s best restaurants and wineries and help a great charity at the same time. 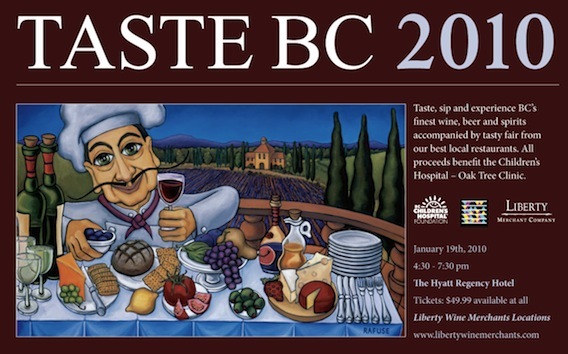 Tickets for Taste BC can be purchased at all Liberty locations for $49.99 each. The event happens Tuesday, January 19 from 4:30 to 7:30. Remember, all proceeds goes to the BC Children’s Hospital â€“ Oak Tree Clinic. What a great way to have a night out and help those in need. I’m in Vegas for the Affiliate Summit right now but I’ll be home in time for Taste BC. I hope to see you there! Here’s a video from last year’s event.